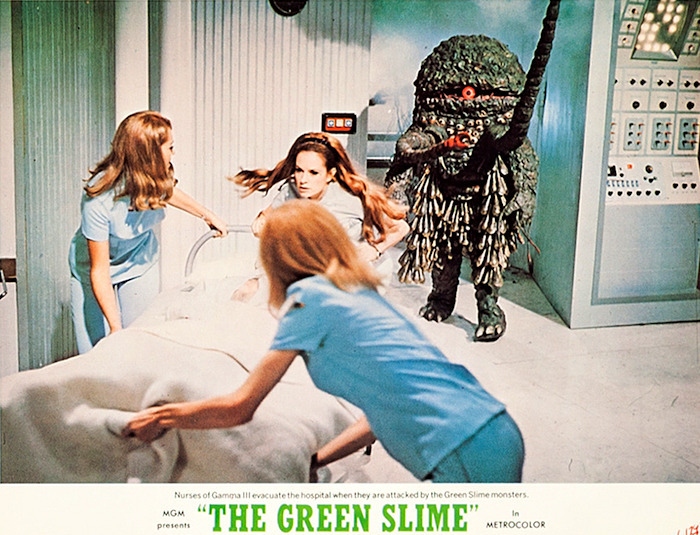 Blu-Ray Review: The Green Slime (1968). A group of intrepid astronauts, lead by Robert Horton and Richard Jaeckel, visit an asteroid (and destroy it before it collides with Earth). One of them returns to space station Gamma 3 with some kinda green goo on his spacesuit. The goo soon transforms into dozens of nasty-looking green monsters with tentacles and a single red eye. Thanks to 2001: a space odyssey (1968), The Green Slime oozed into theaters woefully behind in the special effects race. 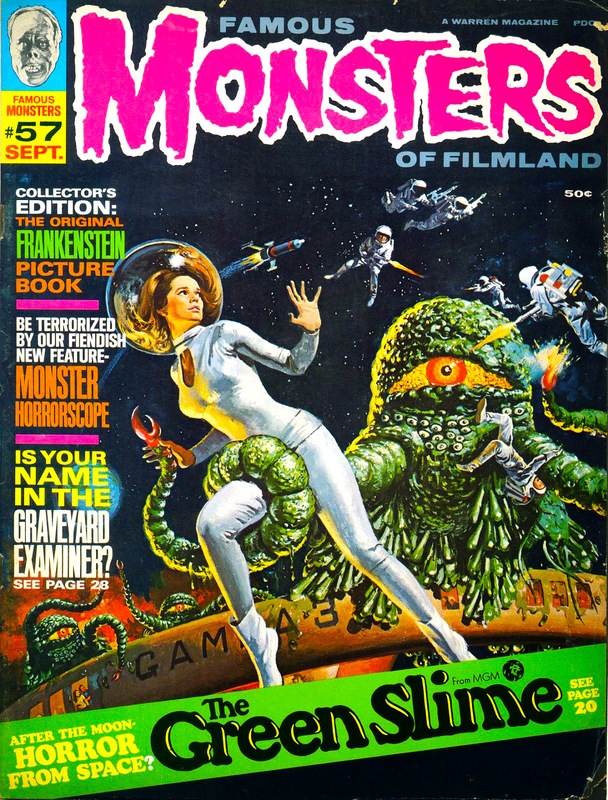 That’s not a complaint, as I’m a big fan of spotty practical effects, rubber monsters and cheesy miniatures. Fact is, everything in this movie is absolutely perfect for what it is. Writing, acting, sets, effects, music — they all suit each other. I love that the lighting rig is clearly reflected in the space helmets as our heroes explore the surface of the asteroid. I would’ve been disappointed if a wire wasn’t visible on a spaceship somewhere along the way. If the monsters were something other than Japanese guys in rubber suits, well, that would’ve ruined it for me. And the terrific theme song — from Richard Delvy of the surf band The Challengers — is the cherry on top of the whole gooey mess. The green slime doesn’t show up green in this faded old 35mm publicity slide. Believe it or not, I was a little concerned that the improved detail, contrast, color, etc. of the Warner Archive Blu-Ray would take away from the cheesy enjoyment packed into every frame of The Green Slime. But I was wrong. The silver-painted plywood grain of the space station is clearer than ever. The wires on the space ships are easier to spot. And the colors really pop, though I think the tint was a little truer on the old DVD. The audio’s clean and crisp — and there’s an original trailer to marvel at. The movie’s a gas, and the Blu-Ray’s a real beauty. Essential to those who dig this kinda stuff. One last thing. Given the perils of Gamma 3 and considering the giant slug hiding in the asteroid in The Empire Strikes Back (1980), there’s an important lesson to be learned: stay the hell away from asteroids. 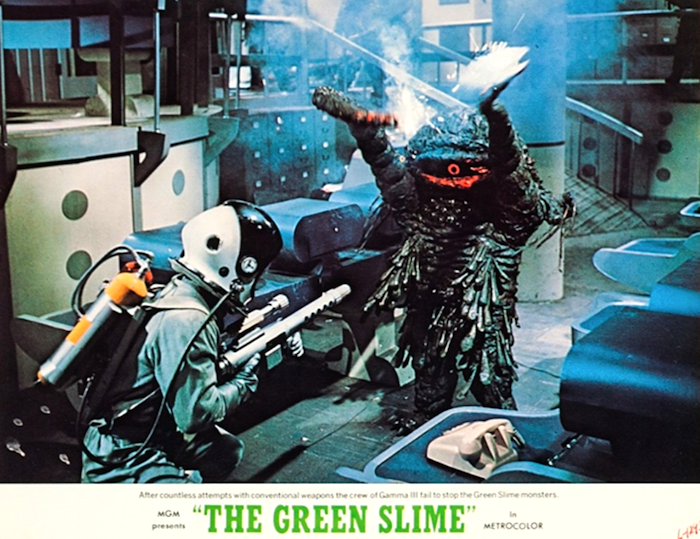 Blu-Ray News #139: The Green Slime (1968). 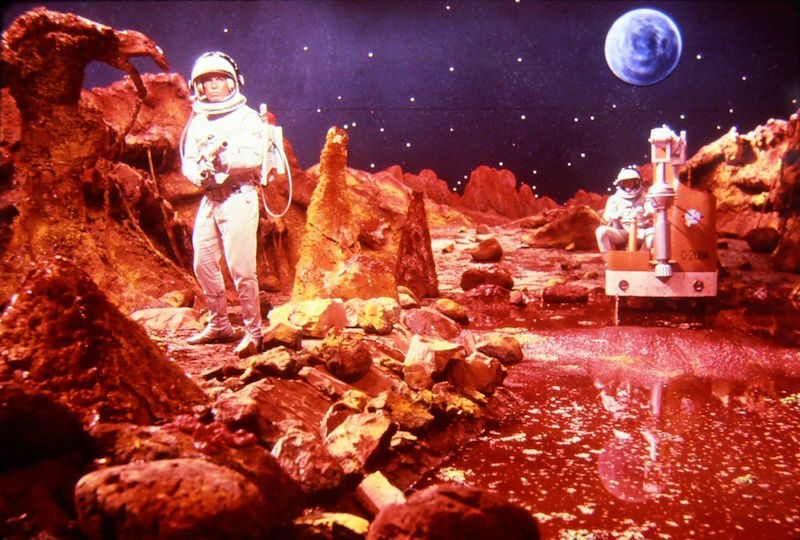 With Kubrick’s 2001: a space odyssey (1968), MGM took science fiction, and filmmaking in general, a huge leap forward. 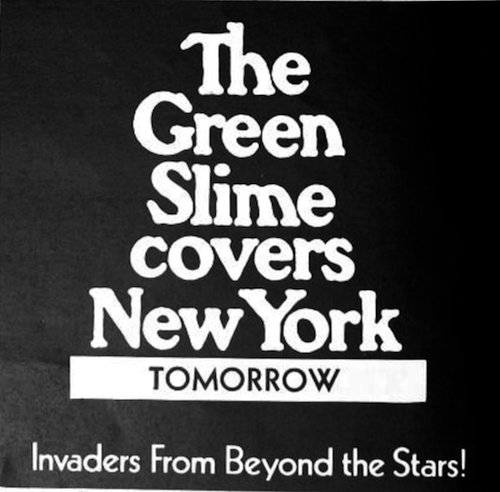 With The Green Slime, later that same year, they took it backwards just as far. The result, a wonderfully cheesy Japanese/US co-production, is coming to Blu-Ray from our intergalactic friends at Warner Archive later this year. Some astronauts visit an asteroid (and destroy it), and one of them comes back with some kinda green goo on his spacesuit. The goo soon transforms into nasty-looking green monsters with tentacles and a single red eye. Filmed in Japan by a Japanese crew, with an American cast (and script), it’s slightly related to a series of sci-fi pictures from Italian director Antonio Margheriti (Wild, Wild Planet; War Of The Planets; War Between The Planets; and Snow Devils, all from 1965). If you have one of these, please consider leaving it to me in your will. The title tune is terrific. 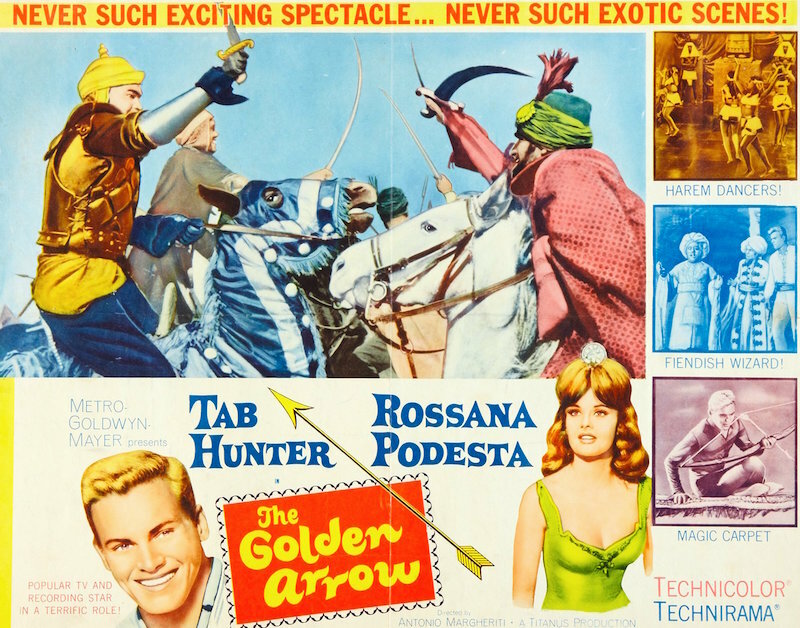 And if all that doesn’t promise an hour-and-a-half of cheesy goodness, note that it features Luciana Paluzzi, an actress with one of the greatest 60s and 70s filmographies of them all: Bonanza, Muscle Beach Party (1964), Thunderball (1965), Hawaii Five-O and more. 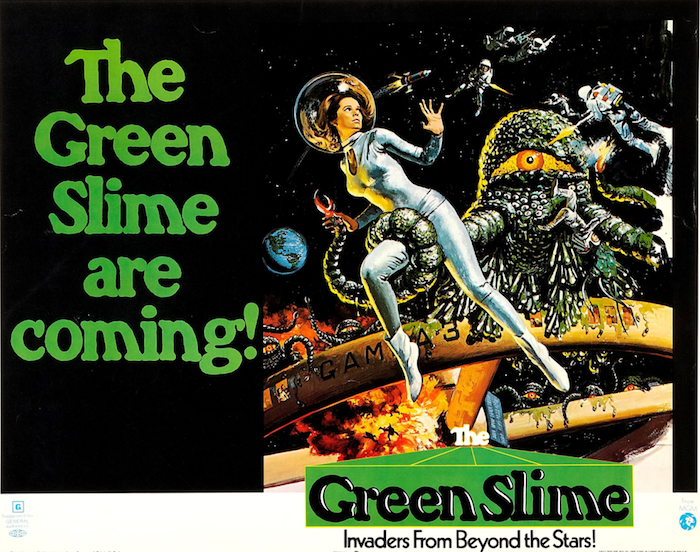 The Green Slime announced for Blu-Ray — this is a red-letter day.